The Mr. Gasket Fuel Pressure Regulators allow you to fine tune the fuel pressure to meet the demands of your engine and injection system. It adjusts fuel pressure from 1 to 6 pound and it fits 5/16 inch and 3/8 inch inside diameter fuel line. It includes all fittings, hose and clamps needed. It is not for fuel injected systems. Adjust Pressure from 1 to 6 lbs. 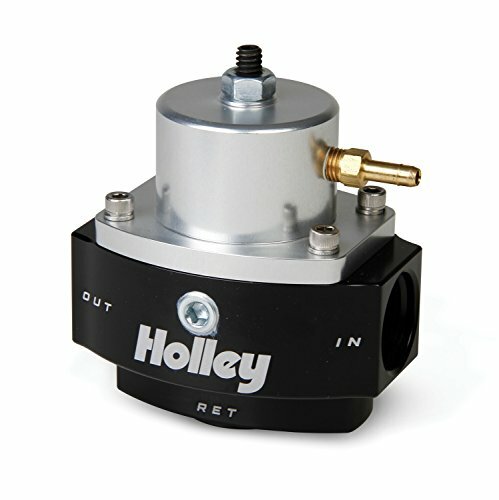 Holley Billet Fuel Pressure Regulators are part of a complete line of fuel system products from Holley. They are precision machined from 6061 T6 billet aluminum for strength and durability. They feature a black bright dip anodized body and a clear bright dip anodized top for corrosion resistance and good looks. 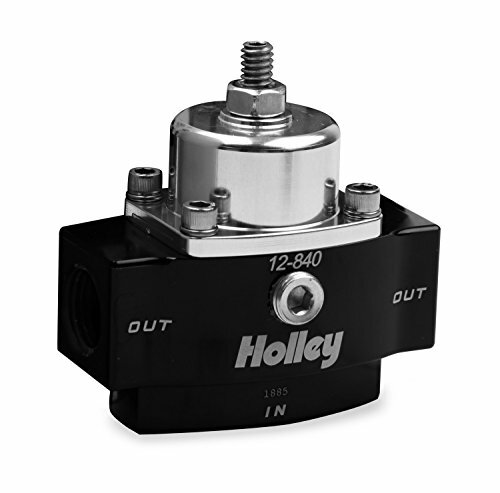 Holley Billet Fuel Pressure Regulators are available in a variety of configurations. 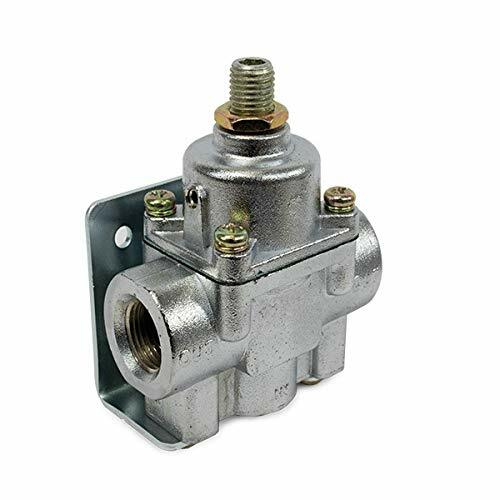 This fuel pressure regulator is used to adjust to fuel pressure requirements of various carburetors. It includes 3/8" pipe thread inlet and outlet ports and fits systems with a return line back to the fuel line. 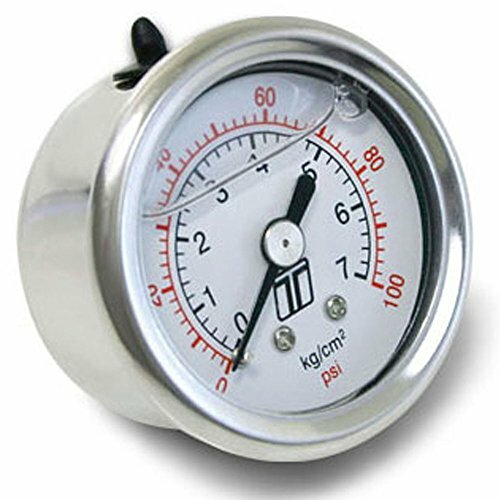 It allows for quieter operation and has a pre-set pressure of 7 PSI with a range of 4.5 to 9 PSI. AEM's Honda/Acura Adjustable Fuel Pressure Regulators are capable of supporting enough fuel flow for engines up to 1000 horsepower. 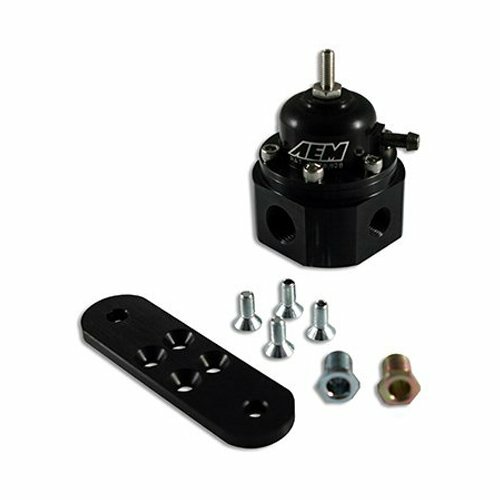 AEM's patented interchangeable discharge ports enable the regulator's output to match the output of any fuel pump. 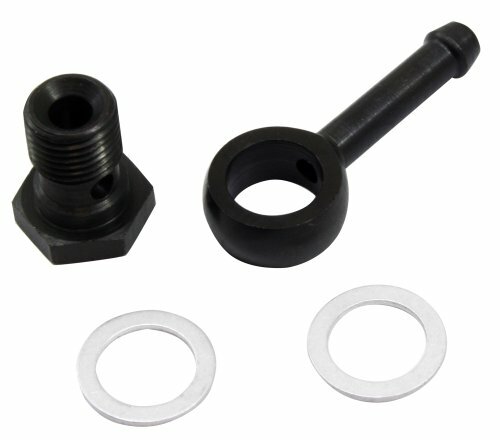 AEM includes a custom barb fitting to accommodate the factory fuel hose and the base of each regulator is tapped to accept a -6 AN or 9/16-inch x 18 fittings. Warranty: Please note that before we can issue a Returned Merchandise Authorization number (RMA) for AEM Electronics products, it is first necessary for the installer or end user to contact our Electronics tech line at 1-800-423-0046 to discuss the problem. Most issues can be solved over the phone. Under no circumstances should a system be returned or RMA requested before the above process transpires. Advanced Engine Management Inc. warrants to the consumer that all AEM High Performance products will be free from defects in material and workmanship for a period of twelve (12) months from date of the original purchase. Products that fail within this 12 month warranty period will be repaired or replaced at AEM’s option, when determined by AEM that the product failed due to defects in material or workmanship. This warranty is limited to the repair or replacement of the AEM part. In no event shall this warranty exceed the original purchase price of the AEM part nor shall AEM be responsible for special, incidental or consequential damages or cost incurred due to the failure of this product. Warranty claims to AEM must be transportation prepaid and accompanied with dated proof of purchase. This warranty applies only to the original purchaser of product and is non-transferable. All implied warranties shall be limited in duration to the said 12 month warranty period. Improper use or installation, use for racing, accident, abuse, unauthorized repairs or alterations voids this warranty. AEM disclaims any liability for consequential damages due to breach of any written or implied warranty on all products manufactured by AEM. Warranty returns will only be accepted by AEM when accompanied by a valid Return Merchandise Authorization (RMA) number. Credit for defective products will be issued pending inspection. Product must be received by AEM within 30 days of the date RMA is issued. This fuel pressure regulator is the ultimate fuel pressure control unit designed to work on all naturally aspirated EFI, turbo, and supercharged applications. It provides the correct fuel pressure for high performance fuel injected systems. It features a range of adjustability from 35 to 65 PSI and features a built-in gauge port, mounting bracket, 2 AN -8 O-ring fittings, and a AN -6 O-ring return fitting. 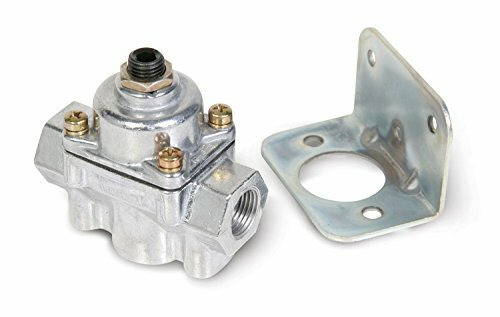 Carburetor Fuel Pressure RegulatorFuel Pressure RegulatorFuel Pressure Regulator; Billet Aluminum; For Use w/Fuel Pump That Does Not Need To Be Bypassed; Black Anodized Top; 4.5-9 psi. ; -8AN Inlet/Outlet;SPECIFICATIONS:WARNING CA Proposition 65: YesWARNING CA Proposition 65 Message: WARNING: Cancer and Reproductive Harm - www.P65Warnings.ca.govFEATURES:Designed To Operate Within 4.5-9 PSI; 7 PSI Preset.250 in. [1/4 in.] 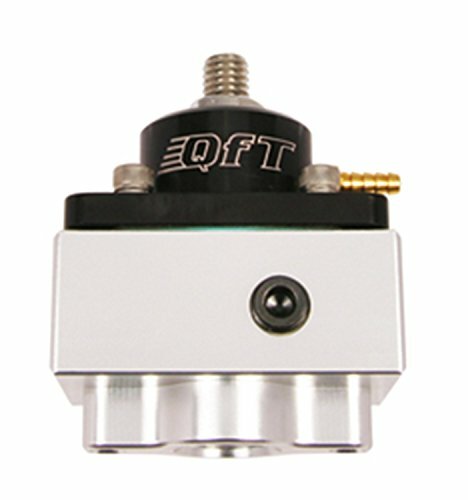 RestrictionCompatible with QFT Billet Fuel Pressure Regulator LogsCan Be Used With Gas - Alcohol - E85 FuelsBillet Regulator - Designed for use with a fuel pump that does not need to be bypassed. Black anodized top has a fitting for boost referenced applications and regulator body has port for fuel pressure gauge. Comes with laser cut stainless mounting bracket and hardware. #8 AN O-Ring fittings required. 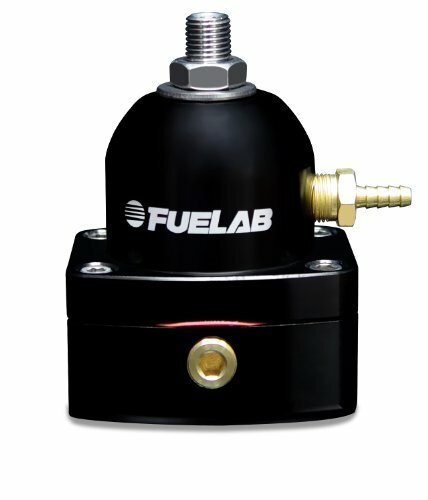 "Innovators in fuel systems" is more than just a by-line. 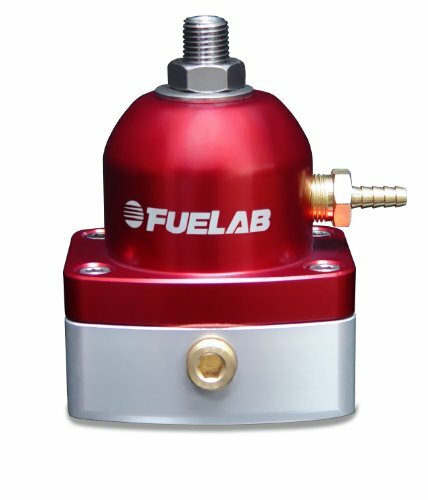 Quick Fuel Technology, since its inception in 1998, has grown exponentially in its 11 years of business culminating into the benchmark by which performance carburetors are measured. The growth and success of Quick Fuel Technology is attributed to the strength and determination of its staff. All of the innovations you see are the product of a team that is both experienced and involved in motorsports. We continue to develop new products so that we can stay on the forefront of innovation. Over the years, Quick Fuel Technology has made considerable strides to become a stand-alone carburetor manufacturer. This increase in efficiency and capability has allowed us to continuously upgrade our products while keeping the prices low. Keeping true to our motto, we look to the future and constantly seek the next innovation. 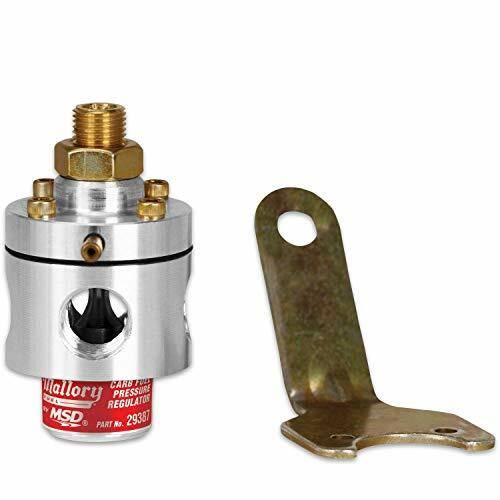 Mallory Universal High Performance Adjustable Fuel Pressure Regulator. 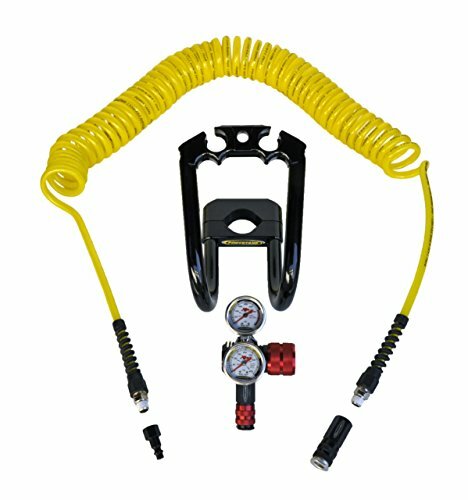 Base pressure adjustable from 3-12 psi, 3 Port Return Style, Boost referenced design allows fuel pressure to rise on a 1 to 1 ratio with boost. Supports medium (400 HP) to high horsepower (1000HP) applications. 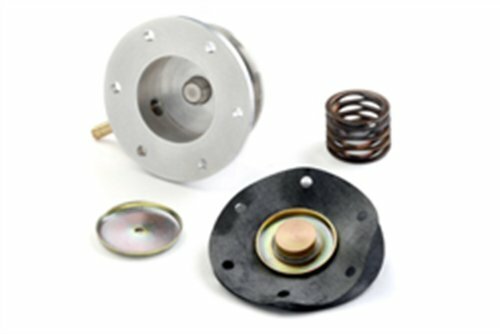 Return Style Regulators extend Fuel pump life and help eliminate some of the noise associated with deadhead type regulators. 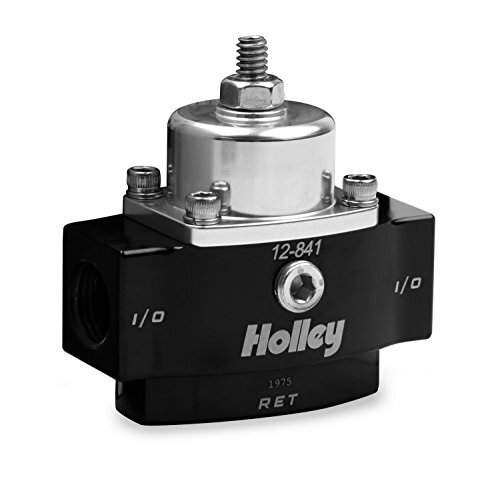 The regulator is recommended for Mallory COMP Pump 110, and 140 Series Electric Fuel Pumps. The included bypass spacer works to modify a Comp Pump 110 and 140 Series Electric Fuel Pump if needed. Constructed from CNC-machined Clear anodized billet aluminum for maximum performance and durability. Fuel Pressure Regulator accept port style and non-port style union fittings without interference. Several configurations are available, supporting carbureted applications as low as 1 PSID to fuel injected applications up to 125 PSID. This Fuel Pressure Regulator has a -6AN return port located on the bottom. While a majority of Turbosmart products are used on street cars, the design and testing procedure is identical to the high-end purpose-made racing products. Turbosmart products are subjected to a range of tests performed in the most demanding environment the race track. Since its inception, Turbosmart has been involved in various forms of motorsport. 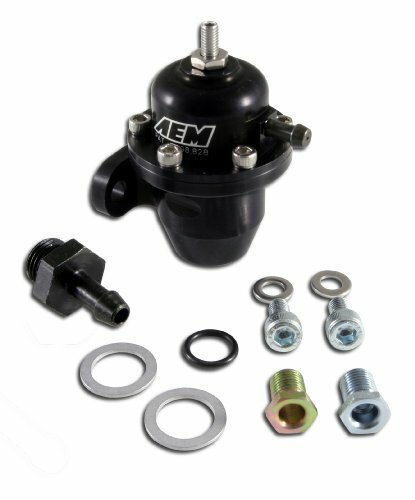 Adjustable fuel pressure regulator 90 degree return fitting for AEM fuel pressure regulators. Includes -6AN banjo bolt, fitting and two O-rings. Our aluminum regulators are sure to last with a protective and great looking anodized finish and are adjustable from 5-9 psi. This regulator is recommended for high flow setups to protect your carburetor for smooth and consistent performance. 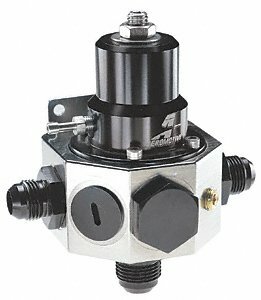 There is one 3/8" NPT inlet and two 3/8" NPT outlet ports with a single 3/8" NPT block off included in one of the outlets.